Three men have been arrested as part of an investigation into an international illegal immigrant smuggling network through Dublin Airport. Two of those arrested are Aer Lingus employees at the airport. In a statement, the airline said it is co-operating fully with gardaí. The three men, aged 28, 56 and 61, were arrested at Dublin Airport last night and are being detained at Ballymun and Coolock garda stations. They are due to appear in court tomorrow morning charged with immigration offences. Officers at the Garda National Immigration Bureau believe the scam has been running for years and that up to 100 illegal immigrants a year may have been smuggled through Dublin Airport. 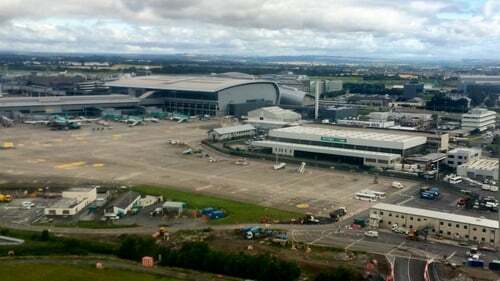 Both Aer Lingus and the DAA, which manages the airport, say they are co-operating with the Garda Immigration Bureau and assisting them with their inquiries. A DAA spokesperson said they will not be making any further comment at this time. Gardaí identified a so-called travel agency based in a nondescript building in a backstreet in Rome and allegedly involved in channelling illegal immigrants from Asia - China in particular - into Dublin. When the illegal immigrants arrived into Dublin airport they were met by a contact who escorted them to a secure area and provided them with uniforms or hi-viz jackets disguising them as Aer Lingus employees. They were then put in cars and trucks that had security clearance and driven from the airport to a safe house in the city. Tánaiste and Minister for Justice Frances Fitzgerald has said any breaches in Ireland's immigration system - if there are breaches - must be examined fully to get to the facts. She welcomed the work of gardaí and said this was an international issue that we work on day-in day-out. Ms Fitzgerald said that international trafficking impacts on Ireland as well as every other European country. We see this in relation to women being trafficked into the country for prostitution, illegal immigration and it is important that this is fully investigated, she added. Asked if she was following up with the DAA and Aer Lingus on this she said it was very early days and she wanted to see what facts would emerge from the investigation. Ireland was working closely with other European Union member states on this issue, the minister said. The Chief Executive of the Immigrant Council of Ireland has expressed concern for those who may have been the victims of human trafficking. Speaking on RTE’s News at One, Brian Killoran said some people have complex motivations for trying to enter countries and some may have been exploited.